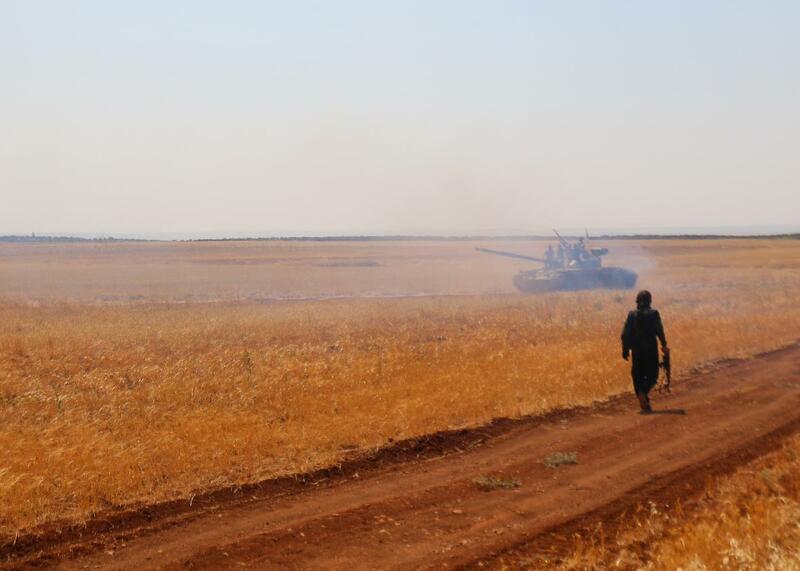 Rebel forces from Jaysh al-Islam hold a position on Aug. 24, 2015, near the frontline in the al-Zahra area, on the northwestern outskirts of Aleppo. The worsening refugee crisis in Europe has woken the world up to the urgency of the ongoing violence in Syria, which has killed more than 250,000 people in addition to the millions displaced. Only a resolution of the four-year-old conflict will stop the global refugee crisis, but at the moment, the prospects for such a resolution are pretty dim. The big story this week is reports that Russian troops have been participating in military operations with Syrian government forces, and U.S. intelligence sources have been telling several media outlets that there’s been a significant buildup of Russian arms and equipment in the country. The U.S. has warned Russia against increasing its aid to Assad. But the Kremlin has said that it’s no secret it supplies aid to Syria, a close Russian ally since the Soviet-era, and doesn’t understand the “strange hysteria.” Bulgaria announced this week that it would not allow Russian military planes to fly over its territory due to concerns over the buildup, but Iran—another Syrian ally—stepped in to open up its own territory. The stakes of all this are higher than normal as Russia reportedly hoped for a meeting between Putin and President Obama at the U.N. General Assembly in New York later this month to discuss the crisis in Syria. Putin may hope to join the coalition fighting against ISIS as a means of normalizing relations between Russia and Western countries that have been strained over the situation in Ukraine. However, Russia’s vision for an international anti-ISIS coalition includes Assad’s military. This is probably a nonstarter for the U.S. due to reports that Assad has been helping ISIS as well as continuing to use chemical weapons against civilians. British Prime Minister David Cameron said this week that both ISIS and Assad “have to go,” by military force if necessary. The thing is, while the U.S. would also like to see Assad go, it hasn’t yet shown any willingness to use military force against him, instead launching airstrikes only against ISIS and the al-Qaida–linked Jabhat al-Nusra, while training “moderate” rebel groups fighting against both ISIS and Assad. Being a little bit at war may sound like being a little bit pregnant, but that about sums up the situation between the U.S. and Assad’s government right now. While none of the alternatives look particularly appealing, the current U.S. strategy against both Syria and ISIS seems hopeless. Efforts to train an anti-ISIS, pro-Western rebel force have been slow-going, so the U.S. is shifting its emphasis to aiding local Kurdish guerillas, who have been much more effective on the battlefield. The problem with that strategy is that neighboring Turkey, which has pledged to help in the fight against ISIS, has also launched a violent crackdown against its own Kurdish separatists. There’s no lack of allies against both ISIS and Assad. The problem is: They all hate each other. Assad’s troops are losing ground, but mostly to the jihadis. Government forces effectively withdrew from the northwestern Idlib province after al-Nusra captured an airbase there this week. Another airbase in eastern Syria has come under heavy attack from ISIS. So even if Putin managed to convince Western countries to hold their noses and support Assad as the lesser evil against ISIS—and it’s not at all clear that’s what he is—he may not even have the military capability to be much of an ally anymore. If your mind is blown that I am even discussing the possibility of an alliance with Assad, especially as the refugee crisis has finally woken up the world to the urgency of Syria’s chaos, that pretty much sums up how remote a resolution to this bloody crisis looks right now.